Welcome to my automotive link page. The purpose of this page WAS to post some of the many links that I keep track of in my personal Netscape bookmarks. Now, it has morphed into some up to date info about my new E12 M535i BMW weekend/pleasure car, some trips my wife and I have taken, and other car related stuff. Enjoy! 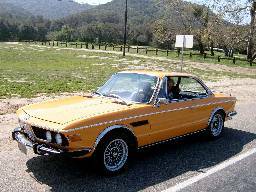 Click on the BMW lineup picture to see pictures from the Windy City BMW Vintage Fest in August 2005. Click on the Coupe picture to the left to read about the Southern California E9 get-together in mid-March 2004. To read about the trip my wife and I took to Northern California wine country in October of 2003, click the image to the left. Click below to read about our trip to Germany from April 2002!